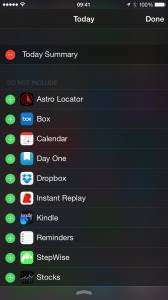 iOS 8 introduced updates to the Notification Center, one of the biggest changes being that iPhone and iPad users can now add widgets to the Today tab of the Notification Center. Whilst not all apps will have a Today Widget, developers are now starting to add these to provide users with new information, quicker viewing of information, or to introduce new and innovative ideas. 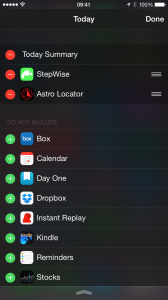 Just add the relevant Today View Widgets to get started. 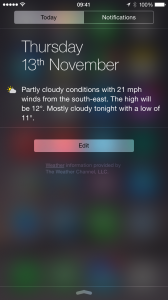 It should be noted that Today View Widgets are only available in iOS 8 and higher. Swipe downwards from the top of your screen to show the Today View. Tap the Today View at the top if it is not already selected. (You can also swipe from left to right). Scroll down to the bottom of the screen and tap Edit. Add your chosen Today View Widget to the Today View by tapping the green + button to the left of it. (You can remove existing Today Widgets by tapping the red – button). You can arrange the order of Today Widgets by tapping and holding the three lines to the right of any active today widgets and dragging widgets up or down. Tap Done at the top right of the screen. If there are new apps with Today Widgets available, the Edit button will show that there are new iOS Widgets. It is worth checking this to add new widgets as they become available. 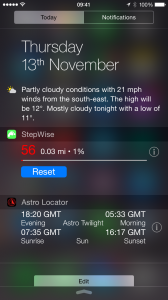 You can see Today Widgets in action in both StepWise Pedometer and Astro Locator.